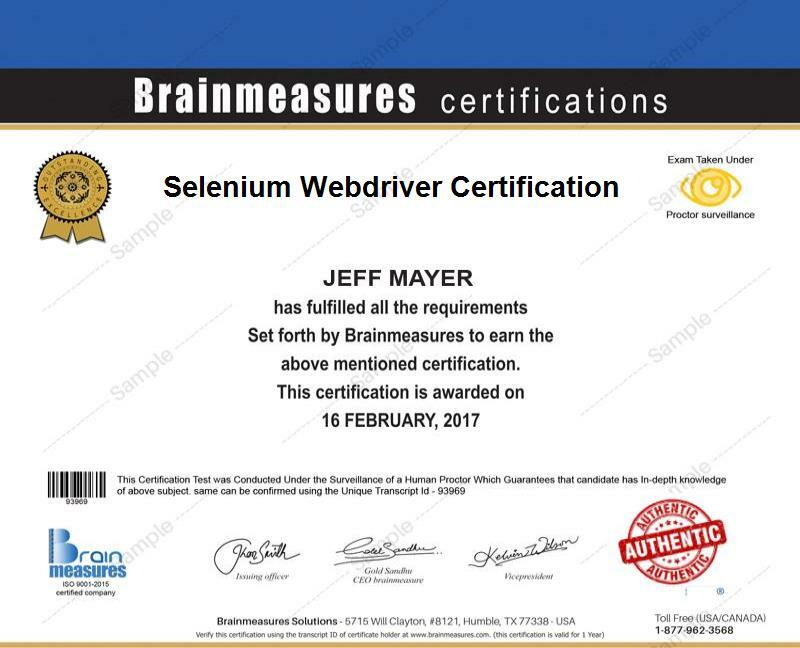 What is Selenium Webdriver Certification? Selenium Webdriver is the biggest change in Selenium 2.0 which has totally changed the environment of testing through Selenium System. This is regarded as a leap forward in terms of browser automation by using the Selenium Server. Selenium Webdriver is designed to provide for ease in programming interface for testing web applications and for dynamic web pages. Selenium Webdriver is a tool for automating web application testing and for verification purpose that intended function is going smoothly without any back-lock. The good thing in Selenium Webdriver is that it is equally applicable for unit testing and traditional way of main testing. Selenium Webdriver works in normal library mode when a project is set up by the user. It is self-contained and user does not require starting it separately or running any installer before using Selenium Webdriver. If we compare Selenium Webdriver with proxy server, then it is far better choice for web applications testing. Selenium Webdriver has a portable testing framework as per authenticated by most of the software engineers and experts that is primarily designed for web based applications. Selenium Webdriver tool has universality in terms of its usage and application in different operating systems with the different techniques of testing. It has greater flexibility in writing tests by providing the integrated environment and import of tests through API mode that have been written in other programming languages such as Python, Java or C#. Selenium Webdriver certification program from Brainmeasures is a unique program which will enable you to become more proficient and skilful in Selenium IDE, its testing requirements, universality, harmonization, synchronization and automation with other web based applications and programming languages. This certification program which will definitely enhance your expertise and efficiency in terms of testing, measurement, checking and debugging in web based applications testing whether on unit based or complete analysis in automated environment. After going through the different topics of Selenium Webdriver certification of Brainmeasures, you will be able to hands on different techniques of testing web based applications whether working online or offline mode and its procedure of testing and verification by using Selenium Webdriver. This all definitely requires joining the Brainmeasures Selenium Webdriver course which is enriched with practical scenarios and different testing techniques at Selenium platform. These will not only an added expertise in your Resume but also cause to increase your salary and chances to get promotion in your career path. Entitlement of Selenium Webdriver analyst, tester, engineer, technician or developer for testing by the help of certification program of Brainmeasures not only develop and increase your expertise but also translates it to increase in income and wealth sources. The average annual salary for those who hold test designing, test writing, IT auditing, test developing and selenium expert positions in an organization is $60,000 per year which can be grow in between $85,000- $145,000 based on level of expertise, experience as well as reputation of the employee and organization in the relevant field. This certification program of Brainmeasures require some technical knowledge, expertise in web based environment and programming languages but enrolment is not confined to just limited target experts. All learners who are eager to enhances their competencies in the testing tools in Selenese environment and increase their expertise in auditing, testing and verification procedures of web based applications in automation environment. This certification program appeals to everyone whether a technical and IT specialist, software engineer, software developer, software auditor, QA and QC engineers as well as students, individuals and corporate players who wish to understand about Selenium IDE and API applications with different techniques of testing.